A trip to Dubai isn’t fully complete without a visit to Abu Dhabi. It is a little over an hour by car and the entire ride you are surrounded by beautiful buildings, plus if you go with a chauffeur and a guide, they will keep you entertained. 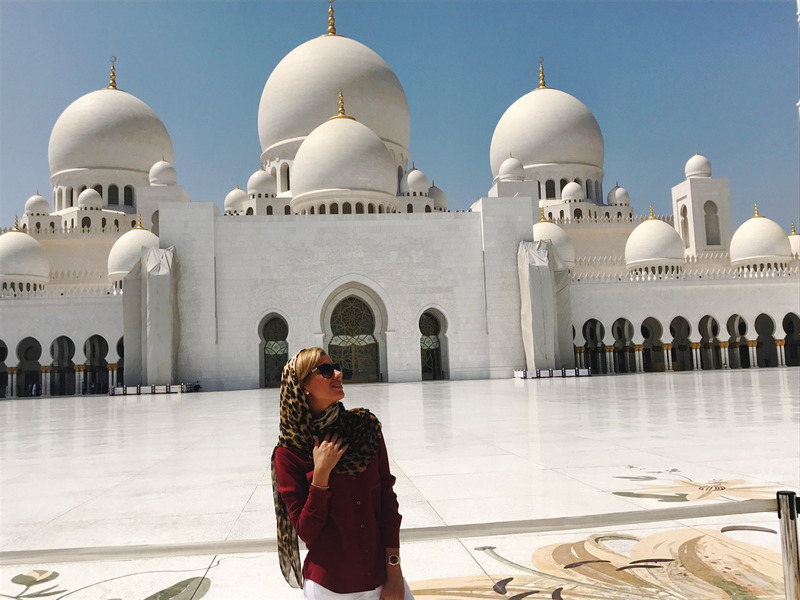 We left in the morning and went straight to the Sheikh Zayed Mosque. The dress code at the Mosque is very strict. They almost didn’t let my grandma in because her long sleeve blouse had a little bit of lace near the elbows! Make sure to wear long pants/dresses (nothing see through), long sleeves, and I recommend bringing your own thin headscarf. It is extremely hot so dress accordingly. Emirates Palace – this luxury hotel is stunning. The impressive interior features gold, mother of pearl and crystal accents as well as 1,002 chandeliers. You must try the famous Palace Cappuccino, which is sprinkled in real 24 carat gold flakes. Yas Viceroy – this beautiful hotel is the only one in the world to straddle an F1 race track and is built half on land and half over water. Four Seasons at Al Maryah Island – this hotel claims exceptional service, 6 delicious restaurants and wonderful views of the Abu Dhabi cityscape. 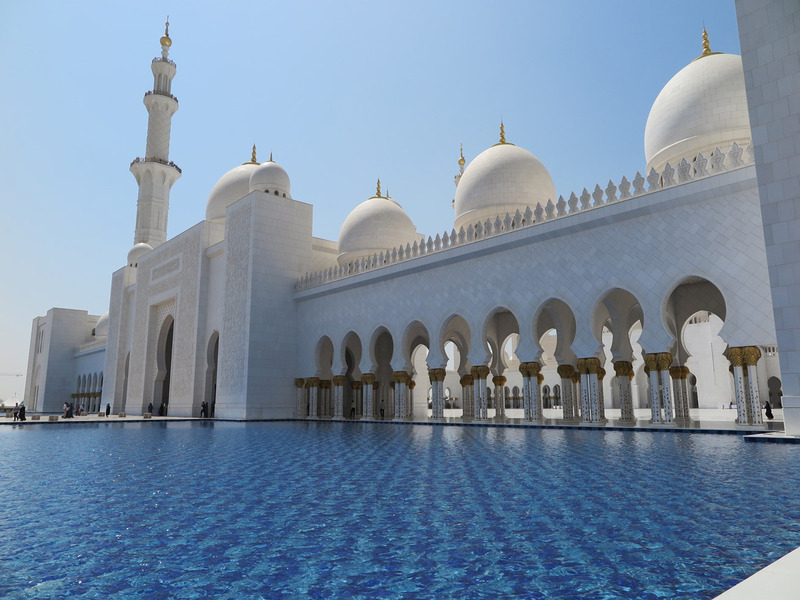 The Ritz Carlton – an exquisite hotel with a private beach and breathtaking views of the Sheikh Zayed Mosque. The St. Regis – St. Regis style located close to stunning city sites, shopping and the beach. Nusr-Et – head here for a delicious lunch and ask for a table outside so you can enjoy the beautiful view. The menu at this Turkish restaurant is spectacular and they serve some of the best cuts of meat in the world. Cipriani – Enjoy Cipriani’s exquisite Italian menu while overlooking Yas Island’s breathtaking marina. 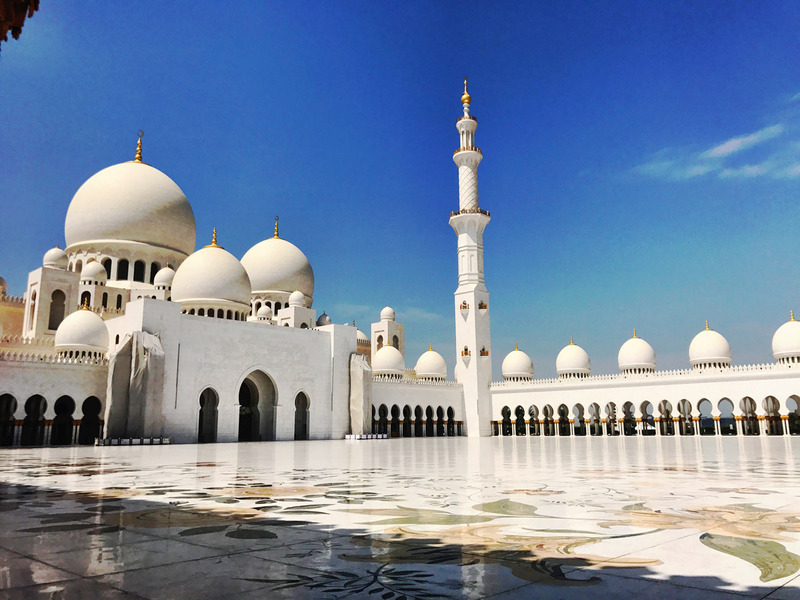 Sheikh Zayed Grand Mosque – this mosque is one of the grandest in the world and is truly amazing. According to the Visit Abu Dhabi website, it is one the world’s largest mosques and can hold up to 40,000 people. The architecture is absolutely incredible – it has 82 domes, more than 1,000 columns, one of the world’s largest chandeliers and hand knotted carpets. This spectacular site should be on the top of your Abu Dhabi to-do list. Ferrari World – this isn’t your usual amusement park. Complete with Ferrari branding and the fastest roller coaster in the world, Ferrari World offers hours of fun for the whole family. Etihad Towers – 5 grand towers located across from Emirates Palace where you can shop, eat and gaze up at the incredible structures. Al Jahili Fort – this spectacular fort is located in Al Ain. It was built in 1891 and exemplifies UAE military architecture. Yas Island – this man-made island is the home to a stunning marina and beach, many wonderful restaurants, amusement parks and shops.